While the world enjoys the first Star Wars stand alone film, Rogue One: A Star Wars Story, production is ramping up on the second, the untitled young Han Solo film. With filming slated to begin in February, the cast is preparing to begin work soon. 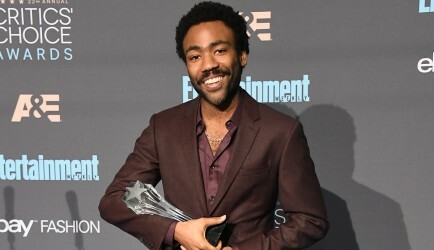 Among the film's impressive cast is Donald Glover (Community, Atlanta) as Lando Calrissian, who spoke about playing Lando in The Hollywood Reporter's recent "Epic Conversation" piece where Glover chats about the industry with the likes of Jon Favreau and Lin Manuel Miranda. "I remember Lando really well. He was like the only black guy in space. And he was the cool one. I just realized, he still has to be cool. And cool is an interesting thing. It changes(...) I was watching Black Mirror, and there's an episode where they go through time and in the '50s, there's a nerd, and by the time he gets to the 2000s, he's just a hipster. He's not a nerd anymore. Cool changes depending on the perspective. Also, it's fun because [the Han Solo movie is set] before [Empire Strikes Back], so he's still figuring it out a little bit, which is fun." The Han Solo A Star Wars Story film hits theatres in 2018. It stars Alden Ehrenreich as Han, Glover as Lando, and Emillia Clarke in an unknown role. The film is directed by Phil Lord and Chris Miller. When you're buying your Rogue One tickets from Atom Tickets, use the promo code "SWU" when checking out to receive a $5 gift on your total order and support us here at The SWU!